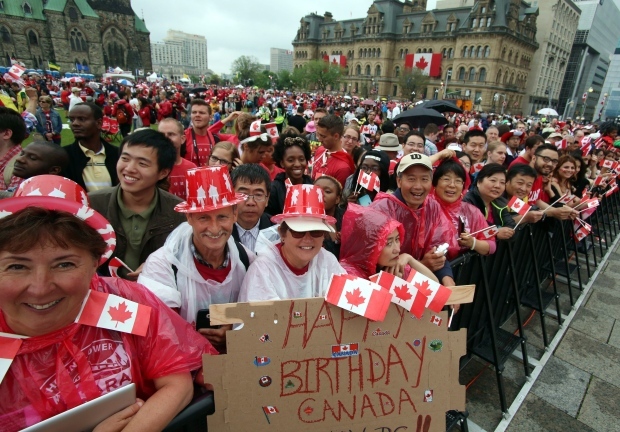 Canadians celebrate Canada Day across country! 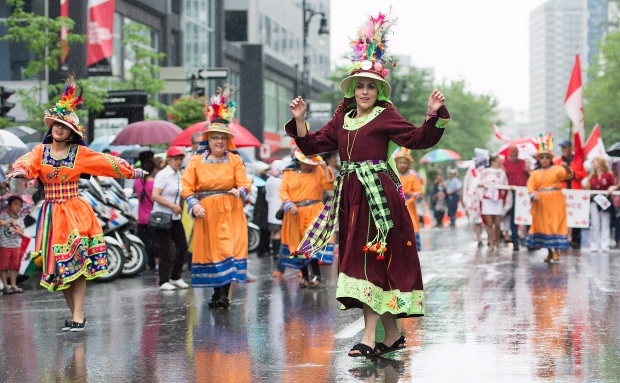 Soggy, gloomy weather in parts of Eastern Canada didn’t stop thousands from celebrating the country’s 148th birthday on Wednesday. In Ottawa, a sea of red and white brought some colour to an otherwise grey day on Parliament Hill, where an estimated 34,000 people braved the rain and cold to attend Canada Day festivities that included live musical performances and speeches by Prime Minister Stephen Harper and Governor General David Johnston. The Canadian Forces Snowbirds also made their traditional flyby of Parliament Hill, which this year included Canada’s ambassador to Ireland Kevin Vickers. The former sergeant-at-arms got to sit in the cockpit of a Snowbird during the acrobatic performance. 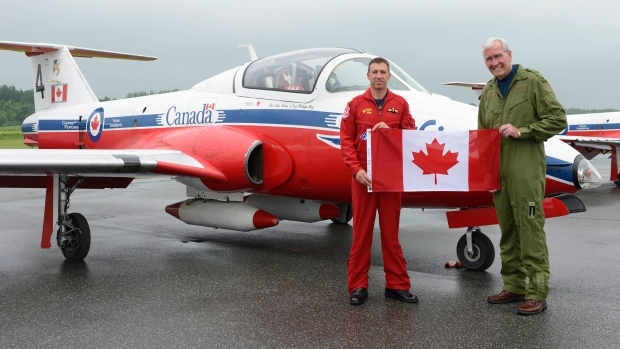 “Flying with the Canadian Forces Snowbirds was an exceptional experience,” said Vickers in a statement released Wednesday. “We are lucky to have such a professional group representing our country across North America. 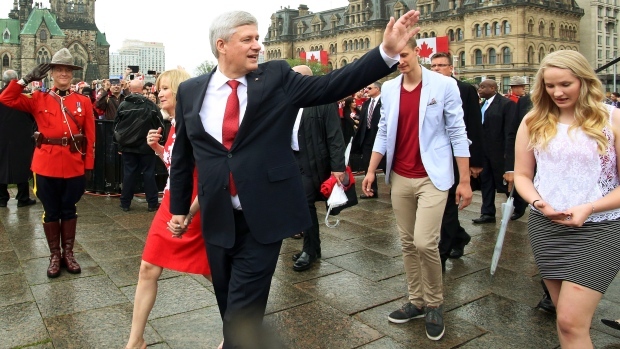 I am proud to be Canadian and to share this day with so many Canadians,” he added. 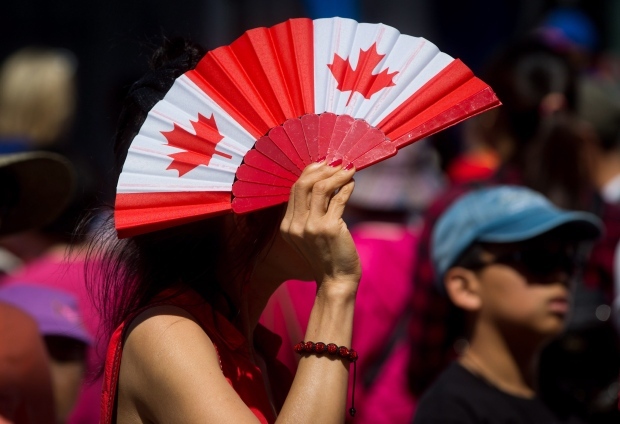 Hundreds of people carrying umbrellas lined the streets of Montreal to watch the Canada Day parade, while families were treated to live performances, midway rides and a gun salute on the front lawn of Queen’s Park in downtown Toronto. The weather was a different story altogether in Western Canada, where a record-breaking heatwave in Vancouver showed no signs of letting up. Ahead of the largest celebration at Canada Place, event organizers were taking extra precautions by placing extra water and misting stations to keep partygoers cool. But the heat didn’t stop 60 new citizens from attending a swearing-in ceremony on the nation’s birthday. The party was also in full swing at Cloverdale Fairgrounds in Surrey, where organizers were expecting more than 100,000 people. In Calgary, people gathered in Prince Island Park in the city’s downtown. One of the main festivities was the formation of a 3,000-person living flag. Another ceremony was held at Heritage Park, where 75 new citizens celebrated the birth of their adopted home. Canadians in Winnipeg and Saskatoon also spent the day outside, as local parks hosted Canada Day picnics. 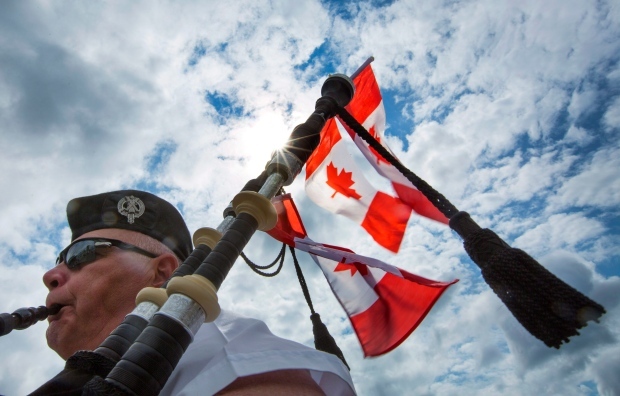 Newfoundlanders celebrated both Canada Day and Memorial Day with a sunrise ceremony at Signal Hill National Historic Site in St. John’s. The event encountered a hiccup when a flag was accidentally hoisted upside-down. In addition to parades and pancake breakfasts, citizenship ceremonies were held across the nation on Wednesday, with the largest ones in Ottawa and Vancouver. Canadians will continue the celebrations Wednesday evening, with fireworks shows expected in most major cities.